Product information "Uranine / Fluorescein disodium salt (100 g)"
Fluorescein disodium salt (so-called uranine) is widely known as fluorescent dye. Exposed to natural or UV light, a uranine solution exhibits a distinct green fluorescence – even in tiny concentrations. That's why it is used e.g. by shipwrecked persons to call the attention of search parties. The biological harmlessness of uranine makes it suitable for manifold applications. For example, it is commonly used for the detection and location of leakage, for leak testing of flat roofs or for fancy colour effects in discotheques and nightclubs. When buying uranine, please make sure you handle it safely and read the safety indications on the label and safety data sheet. The fluorescein will be delivered in a recloseable plastic bottle with 100 g. Please consider that uranine is not suitable for food colouring. 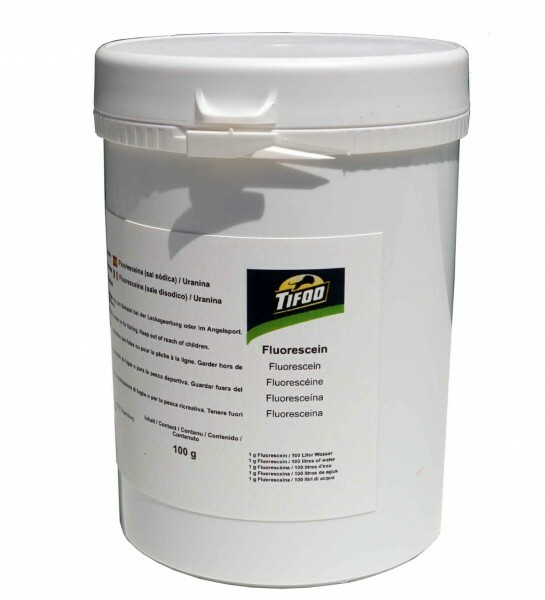 Related links to "Uranine / Fluorescein disodium salt (100 g)"
Instruction manual for Tifoo Uranine / Fluorescein disodium salt (100 g) as PDF file. Customer evaluation for "Uranine / Fluorescein disodium salt (100 g)"